Overview: Order Your Persian Tattoo Now! Body arts, tattoo and tattooing has been one of the most ancient artistic ways that humans have expressed themselves. Throughout different parts of the world, throughout different ages in the history, body piercing and tattooing has been considered as a means to either relate to the gods, or getting strength and courage, express oneself, or as a great way for both men's and women's beautification. Some tribes did the tattoo not only for religious purposes but for tribal identification, honor and recognition. In Persian culture, body arts and piercing has been around for thousands of years. The statues and stone carvings remained from "Achaemenid Persian Empire" (550–330 B.C.) prove existance of body piercing and earrings on ancient Persian gods, kings, and even soldiers. The most famous literal document about Persian tattoo goes back to about 800 years ago when "Rumi", the famous Persian poet, narrates a story about a man who proudly asks to get a lion tattoo but he changes his mind once he experiences the pain coming out of the tattoo needle. You may want to read the original (Farsi) and English version of the story here . Revealing the feminine beauty in women and the masculine power for men has been the two most frequent reasons for getting a tattoo in historic Persian culture. Also, in some cases, tattoo and tattooing has had roots in superstitious believes. Some believed that certain shapes for tattoo keep the evil eye away or repel the bad spirits. There have been suggested tattoo shapes for women to keep their husbands in love with them and preserve the warmth of family love. 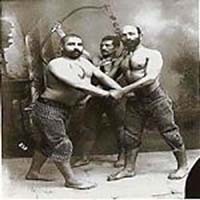 In Brief, showing off in both masculine and feminine forms, medical, spiritual, and religious purposes were the reasons for getting a tattoo in old Persian culture. out the upper body was naked. 2. Women: Women also received tattoos and obviously beatification and makeup was the main intention. They received both temporary and permanent tattoos and in both cases these tattoos were fairly small. The temporary tattoo was a beauty spot and it was the last thing that women received in their Traditional Seven-staged Makeup . main attraction for rebels to receive a tattoo. 4. Men: Among men, tattooing the beloved’s name or signs of love especially on the hands. “Arrow and heart”, “broken heart”, “Candle, flower, and butterfly” , a girl’s face or name have been the most popular tattoos for Persian men back in the old times. As a result of the major motives, arms and chest have been the most popular tattoo spot on the body for men while women got tattooed on their face, forehead, around the eyes, around the lips, and some times on the neck. 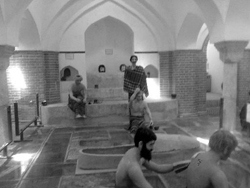 In old ages, Iranians bathe their bodies once a week. Friday - i.e. weekend - was the family day to go to the city’s bathing center (HAMÁM or GARMÁBEH). Men went to the men’s section and women had their own section in that facility. These public bathing centers were the place where Iranians received their tattoos. In other words these DALLÁKs, putting it in contemporary terms, have also been massage-therapists, dentists, barbers, and tattoo artists. Even though for some Iranians getting a body art or tattoo has been - and still is - considered as a taboo, body piercing and tattooing with its thousands of years of history has been kept alive as it has been a great way of self-expression for many Iranians. In fact, in contemporary Iran, same as here in the US, the tattoo and body arts are becoming more and more popular day by day.